We had been told when we entered the zoo that certain animals had feeding times at which you could go and participate. When we heard we could feed the giraffes, we all were excited. So there we stood, waiting in line to wash our hands and receive the carefully torn up romaine lettuce to hand to our long-necked friends. It was a nice place to wait; in the shade and right next to the zebras and warthogs so there was plenty to see. As we chatted together – my husband, children and my mom, and I – we recapped the highlights of our trip. That is until a small boy about four years old ran right through the line to get to the zebra exhibit. We watched in horror as he jumped up and threw one leg over the top, ready to hop in and join his striped friends. Without even thinking, I ran over and grabbed him off the wall. He laughed, wriggled free and began to run away. Several seconds went by with no response and my frustration only grew. 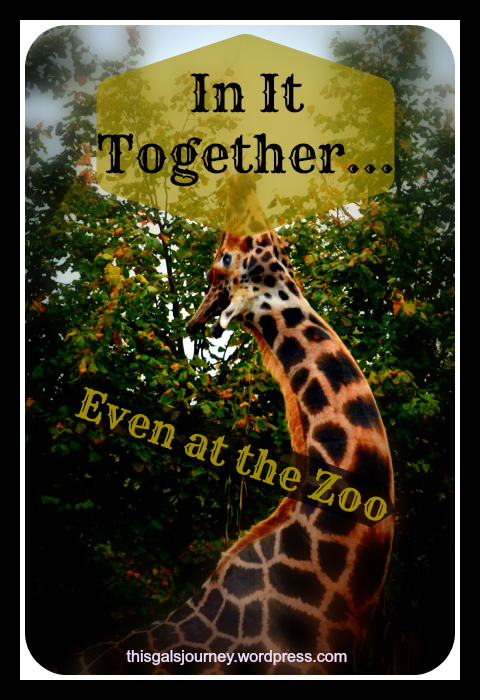 Then I saw her…running to the zebra enclosure, pushing a baby girl in a stroller, fatigue and fear etched on her face. Maybe I was wrong…just a tad. A look of disbelief and sheer desperation crossed her face. I was suddenly quite aware that this was not necessarily a rare occurrence for this little boy. He kept his mama on her toes twenty-four-seven and she was at her wits end. I tried not to eavesdrop as he begged and begged to say and feed the giraffes and as she explained they had already done several extras and it was time to go home. A fit ensued and that poor mama just sighed, grabbed his hand and began to walk away. She paused briefly, smiled a tired, weary smile in thanks and walked away. I’ve thought of that encounter so many times since that day. I’ve talked a lot here about how we’re all in this together; we’ve got to be there for one another, support each other. We need to reach out even if the person isn’t necessarily asking for help verbally. Friends, opportunities to encourage someone else are all around us. Everyday. Everywhere. Even at the zoo. Your homework today is to keep your eyes peeled for just one person whom you can encourage. It could be a kind word in line at the store, finally sitting down to write that note you’ve been needing to write for weeks now, a kind gesture for the waitress who’s having a bad day. Maybe it’s that mom at the mall with all the screaming kids. We’re all in this crazy journey of life together, and our kids need examples of compassion and kindness to look up to and emulate. So let’s get out there and encourage each other today! Did you encourage a random stranger today? Come back and share in the comments what happened, and let’s keep this community rolling forward in love! Thank you for looking out for that boy and his mom. I’ve been where she is since my oldest boy is diagnosed Aspergers. That scenario could easily have been one of my own. Thank God he is now 18. Funny to think that he’d be the one worried for that boy and indignant with the mom and we’d have to reason with him to be more compassionate towards her. Again I have to say how thankful I am that he does have a good heart and loves the Lord. YES, we’ve got to reach out to each other with love and encouragement, life can get so lonely. Oh wow, thank you for sharing! I was immediately convicted for my horrible, judgmental thoughts when I saw her. You’re totally right, you never know what someone has going on in their lives and how much our words and actions can bolster them…or destroy them – even if we are strangers. Jen, I’ve been on both sides of this coin. We make assumptions based on our own experiences and our particular perspectives. I’ve been where you were in situations where I made those leaps of judgement: “why do they let that child do that?” and then I’ve been the mom who has the child who “does” that and have to struggle to stay one step ahead -only it’s usually 2 steps or more behind. It has given me a new appreciation of how difficult it is to parent some children- especially those blessed explorers whose curiosity is satisfied only by experience. My explorer is an adult with two kids of his own now- but he still shows me glimpses of that personality once in a while. I’m just glad I made it through. The encouragement you gave this mom was huge in her heart and I can guarantee that she has tucked it away and replayed it over and over. This is such a great encouragement to me! Thank you so much for taking the time to share!